Drip. Drip. Drip. When you have a faucet that is leaking, it’s important to fix it. Not only because the sound can be annoying, but a broken or leaking faucet is a waste of water and money. A leaky faucet is the most common do-it-yourself repair done on faucets. Want to know how to repair your faucet? The steps to fixing a leaky faucet are relatively the same whether your faucet is KOHLER®, Moen, Pfister or any other brand. When doing a DIY repair on your faucet, there are a few tips to consider to help make the process run smoothly. For starters, before you begin taking your faucet apart, be sure to turn off your water valve under the sink. Then, turn the water on with the faucet handles and let the water lines drain. Be prepared with a towel, so you can mop up any water that is drained out. Be careful not to scratch the metal when you unscrew the faucet handles with a screwdriver. You don’t want to lose any pieces to the faucet when you are taking it apart, so close and cover the drain with a towel. Typically, when there is a leak it’s because the o-ring, washer or valve seat is damaged and needs to be replaced. Here’s a hot do-it-yourself tip: As you are examining all of the pieces make a note, take a picture or lay out the pieces in order to make it easier for when it’s time to put it all back together. If you find you need to replace a part of your faucet, such as a washer, bring it to the DIY hardware store with you so you can be sure you get the right size. No matter which brand of faucet you have, from KOHLER® , American Standard, Delta, etc., follow the manufacturer’s instruction manual and take your time if you need to replace the entire faucet. If after you have made your repair, your faucet is still leaking, it’s time to call for help. 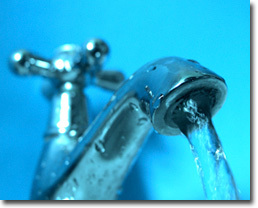 Contact Roto-Rooter Ventura County at (805) 620-3700 for help with your faucet repair.